If you are experiencing moderate pain that traditional painkillers aren't affecting, you could get short-term relief with Co-dydramol. How can Co-dydramol help me? Is it safe to buy co-dydramol from Prescription Doctor? 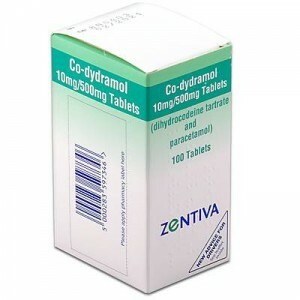 Co-dydramol is a medicine that contains two main ingredients – paracetamol and dihydrocodeine tartrate. Paracetamol is a form of analgesic painkiller that can be bought over-the-counter on its own. It can help relieve pain and is also used to help lower a temperature. Dihydrocodeine is a stronger form of opioid painkiller used to help moderate pain. When combined, the two ingredients form a strong pain killing medication that works effectively in the battle against moderate pain. Co-dydramol is normally prescribed for moderate pain in your muscles or joints. For example, you may be advised to take it if you have pain or inflammation caused by arthritis, sprains or strains. It's sometimes also used to ease pain following an operation. Co-dydramol tablets can be purchased over-the-counter, however these doses are weak. For fast and effective relief from moderate pain, Prescription Doctor can provide a prescription of higher strength Co-dydramol. Fill in a free consultation to find out if Co-dydramol is right for your pain. Co-dydramol medication is best taken with or after you’ve eaten food. You may find it easier to remember to take it alongside a meal or snack. It’s important to always take Co-dydramol as advised by a doctor or pharmacist. The usual tablet dosage for adults and adolescents aged 12 years and over is one to two tablets every four to six hours as required. Remember to read the information that comes with your medication. If you have any further questions, chat live online to a doctor now. In order to get the most from your treatment with Co-dydramol, always follow the advice given to you with your prescription. Avoid driving or operating machinery when taking Co-dydramol as side effects can include blurred vision and dizziness. Due to drug driving laws introduced in the UK in 2015, it may be an offence for you to drive a vehicle whilst you are taking this medicine, if it is impairing your driving or making you drive dangerously. Avoid alcohol when taking Co-dydramol as it may interfere with the medication and worsen side effects. Don't exceed the prescribed dose. It is safe to take aspirin or ibuprofen alongside Co-dydramol. Do not take products containing paracetamol while taking Co-dydramol as this can raise the risk of an overdose on paracetamol which can seriously damage your liver. If you suspect you have taken paracetamol alongside your normal dosage of co-dydramol, contact your GP or a medical professional immediately, regardless of whether you are feeling fine. Is co-dydramol stronger than paracetamol? Co-dydramol contains paracetamol as well as an opioid called dihydrocodeine. Together, they provide a more effective analgesic effect than if either of the ingredients were taken independently. Can you drive after taking co-dydramol? Can you take co-codamol and co-dydramol together? No. You should never take two codeine products together. Furthermore, as both co-codamol and co-dydramol also contain 500 mg of paracetamol, it is strongly advised never to mix two products which contain paracetamol. Taking too much paracetamol can seriously damage your liver. Prescription Doctor is a UK-based company dedicated to providing a highly discreet, confidential and fast online prescription medication service. It enables you the chance to buy branded medicines for a range of popular medical ailments without leaving your home. Our team consist of highly qualified UK and EU prescribers who will assess your individual information quickly and professionally. By using Prescription Doctor, you can rest assured that your order and details will be handled with the utmost care. How can Co-dydramol treatment help me? Product Review: Branded meds, well packaged!